7:30pm - Conway Hall, Red Lion Square (nearest tube Holborn). Organised by ARROW, Voices and Act Together. From 6:30pm - demo outside Lambeth Town Hall, corner of Acre Lane and Brixton Hill (2 mins from Brixton tube). Hoon, a leading hawk (even by New Labour standards), will be addressing a Labour Party meeting inside the town hall. Berlusconi, who heads a coalition which includes Fascists, is Blair's closest European ally, and the main supporter of his pro-US line. He will be meeting Blair, to discuss the war on Iraq. Entry £5 (£2 concs), 7:30pm till midnight - no admission after 11, Bar and Food available. Rebel Music supplied by MUSIC 4 LIFE resident DJ Stevie Dundee, playing soul, r'n'b, reggae and club classics from the 1960s to the 21st century. We will be showing the award-winning documentary about the Gulf War, Hidden Wars of Desert Storm, at 7:30 pm. Details are on main STWC site - simultaneous marches in dozens of other European and world cities ! The Wandsworth Coalition will assemble at 11am outside Clapham Junction Station (St Johns Hill entrance), and travel together to the demo start point. Anybody who wishes to march with our contingent is welcome. Martin Linton, the New Labour MP for Battersea has voted with the war party. He will be addressing this Labour Party meeting, so let him know what you think ! Wandsworth Stop-the-War Coalition will be there alongside local firefighters and the Trades Council. Bring placards, banners, leaflets and whistles. Speakers include Jeremy Corbyn MP, Andrew Murray (National Chairman of Stop-the-War Coalition), Geoff Martin (Wandsworth Trades Council), plus representatives from the Palestine Solidarity Campaign and Balham Mosque. Sponsored by various groups, incl London CND, Voices in the Wilderness, British Afro-Asian Solidarity Organisation, National Assembly of Women, British Muslim Organisation and anti-war Labour Party supporters. Chaired by Rob Storey (National Stop-the-War). Speakers include Jeremy Corbyn MP, Mohammed Arif (British Afro-Asian Solidarity), Christine Shawcroft (Labour National Executive). 8:30 pm at The Ritzy, Brixton. Follows the London Women in Black, as they travelled to the West Bank in early 2002 to act as human shields for Palestinian civilians. Showing as part of the Human Rights Watch Film Festival - more info. This MP has consistently followed the Blair line, and voted for the war. Battersea Trades Council are supporting a lobby at his surgery - assemble 2:45pm at ASDA entrance on Lavender Hill. The snap national demo planned to mark the start of the war will now take place this Saturday. See main STWC site for details. 19:30 till midnight, at St Paul's Church, Rectory Grove, SW4. Full bar, live roots and jazz music, food and comedy from Jeremy Hardy. See STWC events listing, for more details. The Wandsworth and Clapham+Stockwell Coalitions are assembling at Clapham South tube station from 11:30am, and marching to Brixton, arriving there by 1pm for a South London rally in front of the Ritzy Cinema. Several other South London feeder marches (incl from Dulwich, Peckham and Camberwell) will also converge on Brixton. Contact squareonsunday@yahoo.co.uk for more details. 7 - 11pm, at the Ritzy Cafe, Brixton Oval. Free entry. The VSO is an international development charity that works through volunteers. Assemble 10:30 am, and anti-war motor cavalcade will arrive during the lobby. Assemble for 2pm outside BBC Broadcasting House (corner of Langham Place and Portland Place) and march to embassy in Grosvenor Square. As part of a weekend of protest, nonviolent action and civil disobedience at military bases throughout the UK, London actions will centre on the Permanent Joint Headquarters (PJHQ) in Northwood, on the Sunday. Assemble 11am, at Pretty Corner (junction of Watford Rd and Sandy Lane). Nearest tube station is Northwood, on the Metropolitan Line. Contact the D10 group on (07887)585721 or info@thed10group.org.uk, for more info. They will also be holding a nonviolent direct action training workshop and legal briefing on Saturday 5th. Wednesday 9th April 2003 - National Day Of Action, to mark the Budget - Not A Penny For the War ! As Gordon Brown doubles war expenditure, there will be rallies around the country. London will stage an anti-war rally in Parliament Square. Following the hugely successful march on March 22nd, when half a million people (largest ever peace demo during wartime) turned up at 5 days notice, STWC are staging another national march in London. Despite the rapid pace of recent events in Iraq, it is important to demonstrate that we reject the killing after it has happened (not that it will stop, even when the US/UK officially declare the war "over"), in addition to protesting before it happened. Saturday's march will incorporate a 2-minute silence for the victims of this slaughter. This 75-minute film by Leila Sansour documents Hardy's trip to the occupied West Bank as Israel re-invaded it in Easter 2002, and bears witness to the beginnings of the ISM (International Solidarity Movement). It will be presented by the Palestinian ambassador, with Q&A from Jeremy Hardy and Leila Sansour. Assemble in Clerkenwell Green from 12:00, and march to Trafalgar Square. Assemble in Trafalgar Square from 1pm. Speakers include: John Pilger, Dr Mustafa Barghouti, Marwan Bishara, Tony Benn, Jeremy Corbyn MP, Caroline Lucas MEP, Afif Safieh, Juliet Stevenson. That evening, Campaign for Palestinian Rights are sponsoring 'Rave Against The Occupation' at Sahara Nights, 257-259 Pentonville Road, Kings Cross, London N1. 8pm-3am, £8 in advance, call (07776)243164 for more details. Wandsworth Stop-the-War will be staging a vigil outside Clapham Junction rail station (St Johns Hill entrance), from 6pm to 7pm. All are welcome to join us - bring your own signs, placards and props. See Press Release. Contact CADU for more info about national events. Go down from midday onwards, for an informal commemoration of the permanent anti-war presence in Parliament Square, which Brian Haw started two years ago. Speakers include Chris Holt from the Trade Justice Movement, and this meeting is to prepare for the nationwide lobby of MPs on June 27th & 28th. This 75-minute film by Leila Sansour documents Hardy's trip to the occupied West Bank as Israel re-invaded it in Easter 2002, and bears witness to the early stages of the ISM (International Solidarity Movement). With Q&A from Jeremy Hardy and Leila Sansour. Wednesday 11th June 2003 - Tooting Marxist Forum: Palestine: road map to peace or dead end ? 7:30 pm in Colliers Wood Community Centre, Colliers Wood High St (100m from tube). An open debate hosted by the Socialist Workers Party - All Welcome ! Tickets available on door: Admission £5 (£4 unwaged) - Early arrival is advised ! Organised by the PSC (Palestine Solidarity Campaign) and ISM (International Solidarity Movement). Iraqi exile, Tahrir Swift, reports on her visit to Baghdad in June 2003, and presents video footage of Occupied Iraq. Damacio Lopez has been active on DU issues in his native New Mexico, and is an international expert on Depleted Uranium, who serves as a DU consultant for the UN Sub-Commission on Human Rights and has been a member of DU panels both in New York (NGO Committee on Disarmament at the UN) and the Hague (Hague Appeal for Peace). Shebab Deiya (Lost Youth) - Life in the Promised Land: A documentary by the ISM (2003, approx 45 minutes). The film will be followed by eyewitness accounts and a question-and-answer session, with two ISM volunteers recently returned from Palestine. Linton is among the majority of Labour MPs who voted for war. Let him know what you think ! Sunday 26th October 2003 - Public Meeting in Putney: Post Iraq - What's Next ? Speakers: George Galloway MP, Andrew Murray (Chair of National Stop-the-War), Mohammed Arif (British Afro-Asian Solidarity). There will be a picket and protest outside the Reconstructing Iraq conference (admission £1099), which aims to promote the corporate selloff of Iraq. Featured artists: Gillie Nicholls, Carol Ann Weaver & Rebecca Campbell, Torben and Joe, Mel Ellis. Guest speaker: Ken O'Keefe, organiser of the Human Shield Iraq operation earlier this year. 19th-20th November 2003 - Stop Bush ! Wednesday 19th - Join Wandsworth STWC (Stop-the-War Coalition) outside Clapham Junction station (St Johns Hill entrance) from 1pm, for a lunch-time protest against Bush's visit. Wednesday 19th - Tea Party: Mass sit-down and civil disobedience. Join protestors from all over London at Victoria Station by 3pm, to march on Buckingham Palace where Bush will be taking afternoon tea with the Queen. Thursday 20th - Assemble in Malet St (London, WC1) by 2pm, for a national demo against Bush's visit organised by the STWC. Look for the Wandsworth banner. See Wandsworth leaflet, national leaflet, full STWC schedule. Tom Hurndall died of his injuries this evening, January 13th, and his family and supporters have called a vigil for 5:30 pm on January 14th, outside Downing St (on Whitehall). Bring candles, placards and media. Tom Hurndall is the university student from North London who was shot by the Israeli army last April, while doing ISM (International Solidarity Movement) volunteer work in Gaza. He was shot in the head by a sniper while pulling children out of the way of gunfire, and had been in a coma ever since. Protest the massacre of 100s of Iraqis this week by the US and its supine sidekicks. Speakers will include members of Voices delegations who have visited Falluja, Amara and Sadr City over the past 7 years, as well as UK-resident Iraqis with relatives in in Iraq. 12 noon to 2pm, called by Stop-the-War Coalition. Demand an end to the killings and the immediate withdrawal of troops from Iraq. 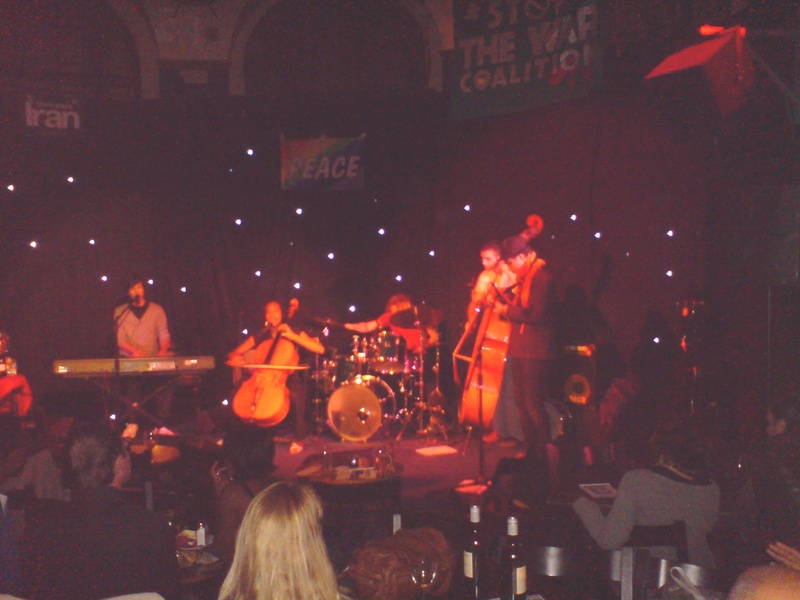 An evening of comedy, music and spoken peformance, with guest speakers from Stop-the-War and the Free Vanunu campaign. Admission £10/6 (concessions) - show starts 8:30pm (doors open 7:30) with food available till 10. Question and challenge the candidates, as we head towards the European, London Assembly and London Mayoral elections on June 10th. We have invited the Greens, Respect, the Lib Dems, Labour and the Conservatives to send speakers. Remember, if you don't vote or attempt to participate, the main parties will gratefully accept that as supine passivity or an endorsement of the status quo ! See leaflet (rotate to view - 'Menu:View:Rotate Clockwise') and Press Release. A week of protests and non-violent direct action to expose the bogus June 30 'power transfer' in Iraq. Voices in the Wilderness is encouraging groups and individuals to take action during the week to expose this fraud and to demand an end to the US/UK military occupation. Andrew Murray, national chair of the Stop-the-War Coalition will be speaking at the regular monthly meeting of the Wandsworth Stop-the-War Coalition. All are welcome, and our regular business will be discussed after Andrew speaks. Organised by Stop The War. The anti-war lawyer, Chris Coverdale of LAAW, will be addressing the regular monthly meeting of the Wandsworth Stop-the-War Coalition. All are welcome, and our regular business will be discussed after Chris speaks. Assemble in front of Safeway on Balham High Rd (near Balham tube/BR) from 10:30am. Following the success of the Nov06 demo, we will be staging a similiar protest near MP Linton's Balham surgery. 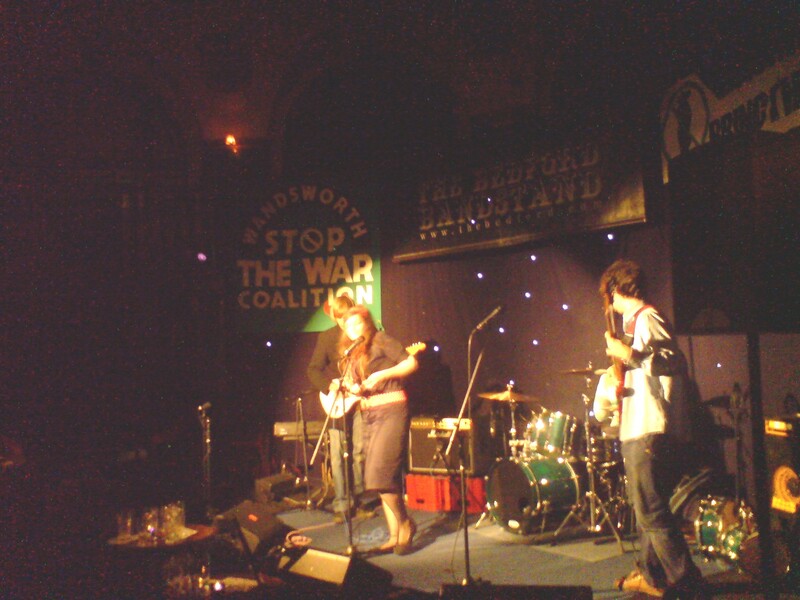 Anti-war fundraising social for Wandsworth Stop-the-War, in the Tavistock room at The Bedford in Balham, London SW12. Food, music and bar, from 8pm till late. Admission £2 - all welcome. It is exactly one year, since 22-year old British peace activist and International Solidarity Movement (ISM) member, Tom Hurndall, died of his injuries following 9 months in a coma, after being shot in the head by an Israeli sniper while shielding children in Gaza. There will be a candle-lit vigil outside Downing St from 7pm. 7:30pm in the Harlequin Room, at The Bedford in Balham, London SW12. plus representatives of religious groups will meet with Wandsworth STWC. Public discussion - all peace campaigners welcome. 7:30pm at The Bedford in Balham, London SW12. The Wandsworth Coalition will tour South London in an open-topped Route Master, to promote the March 19th national demo marking the second anniversary of the illegal and bloody invasion of Iraq, and to say NO to future wars of aggression. Please join us on the bus, or along the route - Timetable. See National Stop-the-War website for more details of the demo on March 19th. 5pm in the Lola Jones Suite, Tooting Leisure Centre, Greaves Place (off Garratt Lane, 5 mins walk from Tooting Broadway tube). Organised by Wandsworth Stop-the-War, Stop Political Terror, and the Free Babar Ahmad Campaign. Leaflets for this Tooting Meeting, and National Demo the following Saturday. Public meeting at 1pm in QB 146, Roehampton University, London SW15. Organised by Action Against War. Palestine evening at the Bread and Roses pub in Clapham, from 7:30pm. An ISM member recently returned from the West Bank will discuss his experiences, plus speakers from Gaza and Nablus. The event will discuss the role of the olive and olive oil in Palestinian society, and how we can help with sustainable development. Taybeh (Palestinian beer) and Zaytoun olive oil will be available. 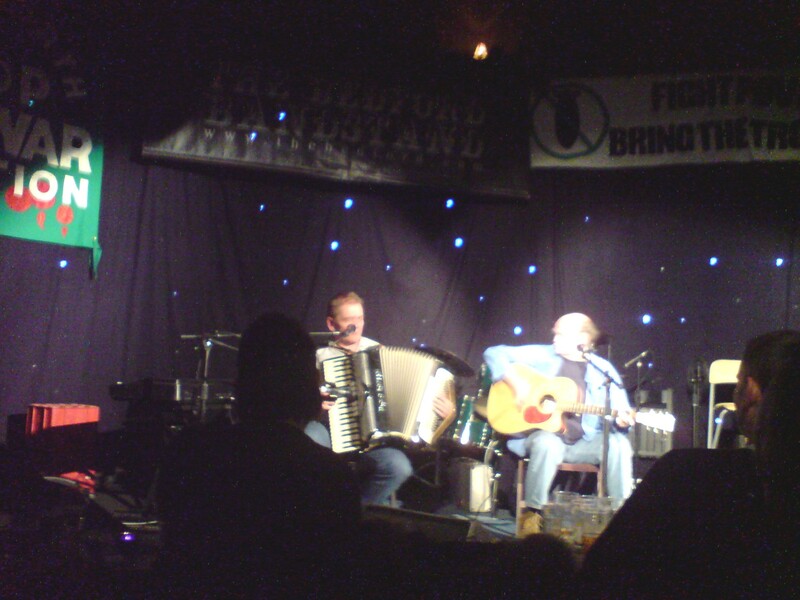 Benefit night for Stop-the-War Coalition. Party night in Clapham, to raise funds to build a childrens' playground in Jalazone refugee camp, West Bank, Palestine. 7:30 to 11:30pm, The Sun Pub, The Pavement, Clapham Old Town (opposite main bus stop). Bring your own CDs along, and the DJ will spin them for a playtime charge of £1.50 per tune. Called by STWC, CND, MAB and others, in response to Thursday's terrorist bombings. A public film showing of Jo Wilding's remarkable eyewitness journeys in Iraq, recently premiered in the Barbican. Speaker presentation on the Wall from 8pm, and screening at 9pm, followed by the ISM-produced short My Dear Olive Tree. A car and cycle tour of the borough, to publicise the national demo on September 24th. Assemble at Clapham Junction at 11am. Posters and balloons will be available to decorate your bikes, but feel free to bring your own. The tour will visit the regular stalls at Clapham Jct, Putney Station, Tooting Primark and Balham, and those who can't join it are welcome to help man those stalls instead. National Stop-the-War demo in central London. There will be a feeder march for South Londoners - assemble 11am at Stockwell tube to march to the starting point in Parliament Square. A public showing of Jo Wilding's remarkable video diary from Iraq. 7:45pm at the Derinton Rd Community Centre, 101 Derinton Rd (corner of Blakenham Rd), Tooting SW17. Soul, blues, jazz, folk, poetry and invited speakers. 7:30pm till late, with food and drink. 7:30pm in the Tooting Islamic Centre, 145 Upper Tooting Rd SW17 (midway between Tooting Bec and Broadway tubes). Organised by Wandsworth Stop-the-War. All welcome. Come and hear delegates from across the anti-war spectrum, from the UK, Iraq and the US. More details on national SWTC site. Assemble 5:30pm outside Clapham Junction, St Johns Hill entrance. One of 100 nationwide vigils to mark the 100th UK soldier to die in Iraq. A speaker from the Justice for Jean Campaign has also been invited. 7:30pm, Stockwell Resource Centre 1 Studley Road (just behind Stockwell tube). Organised by Lambeth Stop the War. Organised by Media Workers Against The War. In conjunction with MC Logic, the Peace Not War co-operative present a night of live hip hop, featuring The Extremists, Big P & Skeme, Chain of Command, Lowkey and Styla and many more. The venue will also show case anti-war documentaries, graffiti art and capoeira displays. The Art Music Politics co-operative present a night of live music in support of the Palestinian Solidarity Campaign. A car and cycle tour of the borough, to publicise the national demo on March 18th. Cyclists please join us - posters and balloons will be available. Assemble in front of Lavender Hill Asda at 11am (1 min from Clapham Junction). National demo organised by Stop-the-War, to mark the International Day of Action. Full details on national website. The Wandsworth banner (big green thing) will be at the southern end of Westminster Bridge from 11.30am. All who live or work in the borough are invited to join our contingent. An evening of music and spoken peformance, with acts including Marcina Arnold, the Funky Jazz4Peace Collective, Paula and Della Rhodes. Admission £10/5 (concessions) - doors open 7:00pm, with bar and food. Monday 21st August 2006 - Lebanon In Ruins, Iraq In Flames, Israel In Crisis Public meeting in Tooting. Tuesday 5th to Saturday 9th September 2006 - subVERSE: An Evening Of Playetry A week of hard hitting political satire at Theatre503. Show starts at 8pm each night. Tickets £12/£7. Call (020)7978-7040 for more info. Tuesday 26th September 2006 - The Iron Wall Palestine film night at the Brixton Ritzy - a PARC film, directed by Mohammed Alatar. Screening starts at 8:30pm, running time 58 mins - followed by Q&A with Palestinian film maker, Osama Qashoo. Organised by the Palestine Solidarity Campaign. An evening of music and spoken peformance, with acts including The Rushes, Davide Sanna, Doreen Leighter & Dave East, Bruce McKenzie. 5th to 7th November 2006 - Faslane 365 Sunday 5th till Tuesday the 7th is the slot assigned to Stop-the-War, within the year-long blockade of Faslane nuclear base to protest against Blair's hope to replace Trident (at a cost of up £75 billion). Londoners who wish to join the blockade on these days as part of a Stop-the-War contingent, should contact the Stop-the-War national office. There are plans to fly from Stanstead as a group, but however you travel, people have to make their way to Glasgow at their own expense. From there, transport to Faslane and accommodation for the two nights is being organised by Scottish groups. An evening of music and spoken peformance, with acts including Wizz Jones, Brendan Coker, Lizzie Shirley, Mother Popcorn and Rona. Special guest, Bruce Kent of CND. Doors open 7:30pm for 8:30pm showing. Bar till midnight, plus food. STWC and CND campaign and book stalls, and DJ. Saturday 21st April 2007 - Special Street Action in Tooting All regular Wandsworth activists, and anybody else who's interested in taking part and helping out, to converge on Tooting again today from 10:30am, instead of the regular Saturday stalls we normally hold around the borough. There will be orange jumpsuits, a "Guantanamo" cage, stalls and leafletting and Bush and Blair may make another appearance too ! This follows the success of the last Saturday "special" 2 weeks ago, and similiar events prior to that. Assemble in same location, outside Primark on Upper Tooting Rd (3 mins from Tooting Broadway tube). Moazzam Begg will also be signing copies of his book, Enemy Combatant. Plus surprise guest artists and a guest speaker. Doors open 7:00pm, with bar and food. Screening at 8:00pm. Bar till midnight, plus food. Organised by students and staff at Roehampton University. LATE ADDITION - Geraint Watkins: Formerly of the Balham Alligators, has sessioned on tour with a who's who of stars, from Van Morrison and Bill Wyman to Vanessa Mae, Status Quo, Tom Jones and many more. Accompanied by Alligators bandmate, Gary Rickard. Guest speaker Ewa Jasiewicz from Hands Off Iraqi Oil will update us on the politics and labour struggles in Iraq's oil fields, and artist John Sacks will be there with pre-launch copies of his visual novel Iraqi Oil for Beginners. There will also be stalls and contributions from the Palestine and Latin American solidarity campaigns. New documentary based on the book of the same name by Norman Solomon, narrated by Sean Penn. Saturday 1st December 2007 - World Against War International conference, open to the public. See national website for details. Friday 11th January 2008 - Close Guantanamo Day of Action, called by the London Guantanamo Campaign. Assemble 10am on Lavender Hill, outside Asda, for the Wandsworth action. The MP for Battersea, Martin Linton, will join the protest. Thursday 7th February 2008 - Battle For Haditha Public screening at 6:30pm at Clapham Picture House, followed by Q&A session with the director, Nick Broomfield of Third Eye Cinema. Update: Q&A was filmed by Channel4, watch out for screening in March. Thursday 21st February 2008 - Public meeting in Putney IRAQ, IRAN, AFGHANISTAN...A WAR WITHOUT END? Saturday 20th April 2008 - Wildflower Walk Experienced walk leader Roy Vickery, a botanist from the Natural History Museum, invites you to join him on a tour of the flora on Tooting Common. Meet in the car-park at junction of Tooting Bec Road with Dr Johnson Avenue, at 2.30 pm. Voluntary collection in aid of Wandsworth Stop the War Coalition. The Wandsworth and Lambeth Stop-the-War groups are organising a coach to Manchester, which leaves Brixton at 7am and Clapham Junction at 7:30am. Returns to London by approx 9:30pm. A Stop-the-War Coalition film night, all welcome. 7:30pm at The Bedford, on Bedford Hill, SW12. Doors open 7:00pm, live acts from 7:30, with bar and food. Plus surprise guest artists and speaker. Thursday 4th December 2008 - Economic Crisis At Home, Spread Of War Abroad Balham Library, Ramsden Rd, Balham SW12 - starts 7:30 pm. This follows the massive national demo on January 4th. There will also be be daily protests at the Israeli Embassy, every evening from 6 pm - continuing in the week beginning Jan 12th. 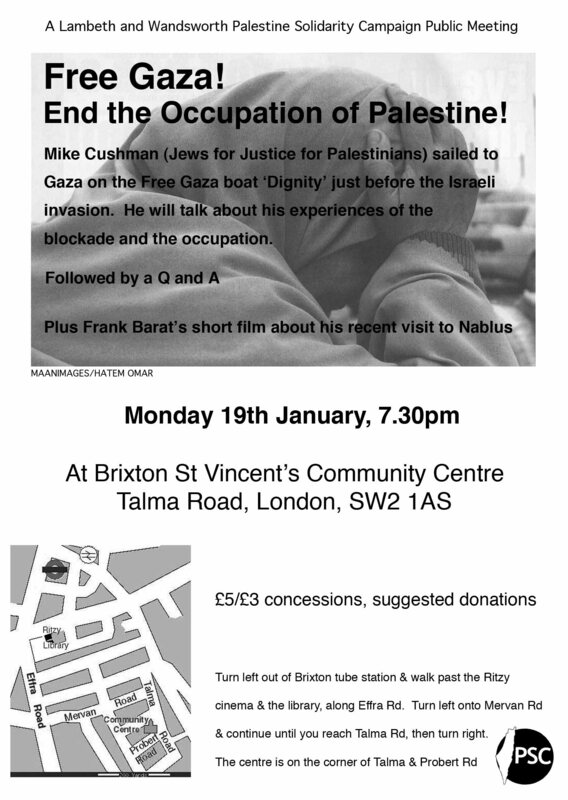 Monday 19th January 2009 - Public meeting with a member of the Free Gaza expeditions 7:30pm at St Vincent's Community Centre, Talma Rd, Brixton SW2 1AS (off Effra Rd, past the Ritzy cinema). Mike Cushman ( Jews For Justice For Palestinians) sailed to Gaza on the 'Free Gaza' boat, Dignity, just before the Israeli invasion. Hear him speak about his experiences - followed by Q&A. Plus, Frank Barat's short film about his visit to Nablus last year. Organised by Wandsworth STWC. All welcome. Organised by Wandsworth STWC. Call 07756493877 for further information. Wednesday 29th April 2009 - Taxi to the Darkside (2007) Public film showing in Battersea, of Academy Award winning documentary on the role of torture in the 'The War Against Terror'. The meeting will focus directly on what we can do to secure Shaker's return to London. An update on the current situation will be provided at the meeting. Long term British resident, Shaker Aamer, is the last London resident being held in Guantanamo Bay. MP Martin Linton (Lab, Battersea) has stated that he would like to see Mr. Aamer returned to the UK and that he had expected Shaker would have been released by now. He has called on local people to take action, and to write to him, other MPs and the Foreign Office with their concerns. Tooting Islamic Centre, 145 Upper Tooting Rd SW17 (midway between Tooting Bec and Broadway tubes). Saturday 13th November 2010 - Cavalcade A cavalcade will visit stalls throughout the borough to promote the vital national demo the following week. Saturday 20th November 2010 - Afghanistan: Time to Go National demo - assemble at Speakers Corner in Hyde Park for 12 noon. See national website for full details. Saturday 11th December 2010 - Free Shaker! Close Guantanamo and Bagram Assemble in Ponton Rd Nine Elms, SW8 5BA - site of the new US embassy. Speaker rally at 12 noon, then march to BAC (Battersea Arts Centre, on Lavender Hill, SW11). Public meeting at 2pm in Grand Hall of BAC, with: Moazzam Begg, Ken Livingston, Jeremy Corbyn MP, Kate Hudson, Lindsey German, Victoria Brittain and many others. Film at 4:30pm: "Outside the Law - Stories from Guantanamo", followed by Q&A with Omar Deghayes and Andy Worthington. Monday 13th December 2010 - The War You Will Never See: Nationwide screening John Pilger's new documentary will be showing simultaneously at the Brixton Ritzy and Clapham Picture House, at 6:20pm. There will be STWC stalls at both cinemas. Come and help with stalls and leafletting, and of course see the film. Wednesday 26th January 2011 - Save Shaker Aamer campaign: Organising meeting Battersea Arts Centre, Lavender Hill, SW11 - 7.30pm start. Amnesty UK, Cageprisoners, LGC, local Labour Party, SWP, CPB reps and other human rights and political campaign organisations in attendance. Joy Hurcombe of Brighton Against Guantanamo to open discussion. Discuss recent events & developments and more, plan future actions. All are welcome. Monday 28th February 2011 - WELFARE NOT WARFARE: Wandsworth Against the Cuts Protest at Wandsworth Town Hall, 6.30pm. The Libraries Committee meets this evening, and many campaign groups will be protesting against their cuts, particularly the closure of York Gardens library. Make your voice heard tonight - come listen to the debate in chamber. Monday 23rd May 2011 - The War You Don't See (John Pilger) Film screening at the Clapham Picture House. Pilger's award-winning documentary, his first film in 3 years, is a powerful and timely investigation into the media's role in war. Followed by a Q&A with John Pilger. Thursday 26th May 2011 - Outside the Law Screening in Balham of a new Guantanamo film, featuring contributions from former UK detainees and the case of Wandsworth resident Shaker Aamer who is still being held without charge after 9 years. Followed by a Q&A with the directory, Andy Worthington. Please contact Sara Mason (sararuthmason@googlemail.com or 0772-5054945) to reserve a seat. Saturday 8th October 2011 - MASS ASSEMBLY Trafalgar Square National gathering to mark 10th anniversary of attack on Afghanistan. Wednesday 21st March 2012 - Time To Cut Trident Budget Day Protest by CND, from 11am on Whitehall, opposite Downing St. The pointless and wasteful spending on nuclear weapons remains ringfenced, while jobs, health and education are cut. Saturday 24th March 2012 - Iran Day Of Action National day of action opposing an aggression against Iran and calling for troops out of Afghanistan. Wandsworth will be running our regular midday campaign stall on St Johns Rd SW11 (near Clapham Jct). The Save Shaker Amer campaign will also be there, campaigning for the return of Battersea resident Shaker Amer who has spent 10 years in Guantanamo without charge or trial. Click here for national events listing. Andy Worthington, campaigning journalist and author 'The Guantanamo Files', will take part in a Q&A session afterwards. Entry will be free of cost, but seating is limited so booking will be on a first come first served basis - please book by ringing or texting 07756493877 stating number of seats required and leave your contact details. Monday 17th November 2014 This month's regular planning meeting will serve as our 2014 AGM. Friday 10th April 2015 - Film Showing: Gasland A film about the impact of the fracking industry on the quality of life and local environment, as told by people in affected communities across the USA. Organised by "No Opencast/Land for the Community" based in Hammersmith and Wandsworth. Free admission. Light refreshments available. With speaker, John Hilary from War on Want. Amidst growing inequality, poverty, the housing crisis etc. there is a need for different approaches and priorities, an alternative vision for our society. With discussion on how we might work together better to bring about positive change and particularly post-election strategy and actions. All local community, resident & tenants, TU, social, left, environment groups and individuals welcome. June 3rd to June 10th 2016 - Chilcott at the Battersea Arts Centre Verbatim play on the Chilcott enquiry, presented by the Lung theatre company. Running at the Battersea Arts Centre, Lavender Hill - nearest station is Clapham Junction. The first of a series of debates on the concept of democracy, debate and dissent in the Armed Forces and the impact on our society and history, held in the same venue where the civil war Putney Debates of 1647 began. Keynote speakers include historians John Rees and Julian Putowski, and former soldiers Ben Griffin, and Joe Glenton.